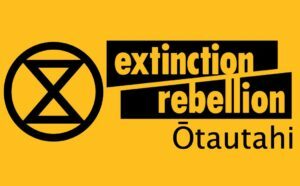 A guest post from Torfrida Wainwright of the Christchurch branches of 350.org and Extinction Rebellion (XR). The tactics XR uses may not be agreed with by everyone in the climate change movement, but there is no denying that action is urgently needed. 2019 – Time to Rebel! 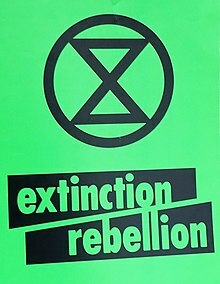 Have you heard of Extinction Rebellion? Maybe not –Aotearoa’s mainstream media is still a bit sleepy despite Stuff’s wake-up call. In a few short months, this movement has spread from UK to 27 countries and throughout Aotearoa. In December, Aotearoa’s first act of rebellion took place in Ōtautahi Christchurch – 40 people turned off Environment Canterbury’s water supply, calling out the regional council’s inability to protect our precious water from pollution and commercial exploitation. We were heartened by the huge upwelling of support for this bold action – water matters to people. It’s suddenly easier to talk about the climate crisis and taking direct action to stop bad things that are happening. As when 15-year old Greta Thunberg addressed the Poland COP gathering, Extinction Rebellion has touched a nerve. Unprecedented numbers of people are now calling on governments to tell the truth about the climate and ecological crisis and to treat it as the dire emergency that it is.What’s particularly new is the numbers readily committing to keep disrupting “business as usual” until notice is taken. We have the means to prevent this tragedy, but not yet the political will. Addressing road-blocking crowds in London, George Monbiot summarises the key changes we need in energy, transport, diet, land-use, forests and economic structure and more. NO government is yet making the urgent changes needed to swing this around. Nothing that climate activists have done so far has made those in power sit up & take notice to the level needed.Many people are now committed to non-violent civil disobedience to pressure and/or mandate their governments to take real action. In the UK, Extinction Rebellion (XR)is blocking roads and in Australia, thousands of school students held strikes in every state. In New Zealand, 11 centres now have an active XR group and the ECan protest marked the first public act of rebellion and the start of many others. How does this differ from what existing groups like Coal Action Network Aotearoa, Greenpeace, 350 etc are already doing? XR brings together the concerns and campaigns that so many of us have been working on into three simple, urgent and determined demands – that governments tell the truth about the crisis, that they use their power to put the country on an emergency footing and make the deep changes needed, and that we set up mechanisms to hold those in power accountable. For decades, we have fought for climate action. But all of this effort has not made a dent in New Zealand’s greenhouse gas emissions, which continue to rise. It’s time to step it up. Given what faces humanity now, we have no other alternative. We have 12 years to swing this round. Even our children know this. XR’s processes and kaupapa feel robust, pragmatic and workable. I’ve personally felt profound relief to share with others my grief and rage at what’s happening, to finally ‘tell it like it is’ in my climate conversations with others – and I’ve been excited to find how easy these conversations suddenly have become and how receptive so many people are. XR is aiming for a global day of mass civil disobedience in mid April. Working towards that date, XR groups are exploring direct actions, gathering resources, reaching out to as many people and groups as possible to gain widespread and mainstream support. We’re working on many and varied actions around the country, and also on an Open Letter to the New Zealand Parliament. Join us, we need your skill and experience as someone already concerned and committed. This is an unprecedented opportunity to catch the wave of concern, to reach many more New Zealanders and to show Government that it has the mandate for the urgent and effective changes we need to swing round our headlong race to extinction. and the short video (George Monbiot’s speech 5mins). This 50min video is factual and moving – watch it with your mates or group. Organise an Open Letter to Government and join in the one we’ll be sending out soon. Join your local group – look for it on Facebook. Direct action, outreach, training, art, feeding the troops, spreading XR stickers, doing presentations, admin etc – it’s all needed! Prepared by Torfrida Wainwright, active in Coal Action Network Aotearoa, 350 Christchurch and Our Climate Declaration. Contact torfrida@snap.net.nz, ph 021 107 3937 or 03 382-0580 or on Facebook.